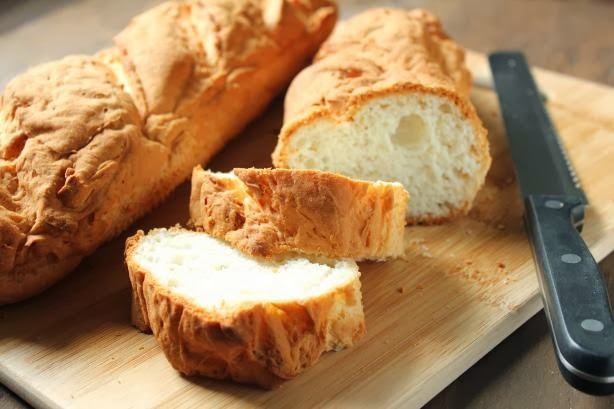 This french bread is amazing!! It tastes so similar to the wheat containing french bread. Plus it freezes wonderfully!!! It's crusty on the outside, and soft and tender within,, You can make it from start to finish in about one hour!! In the bowl of a heavy-duty mixer, place flours, xanthan gum, salt, and egg replacer (if used).Blend with mixer on low. In a small bowl dissolve the sugar in the water, and add yeast. Wait until the mixture foams slightly, then blend into the dry ingredients. Add the butter, egg whites, and vinegar.Beat on high for 3 minutes. To form loaves, spoon dough onto greased and cornmeal-dusted cookie sheets in two long French-loaf shapes or spoon into special French-bread pans. Slash diagonally every few inches.If desired, brush with melted butter. Cover the dough and let rise in a warm place until doubled in bulk, 20 to 25 minutes. Preheat oven to 400 degrees. Bake for 40 to 45 minutes.